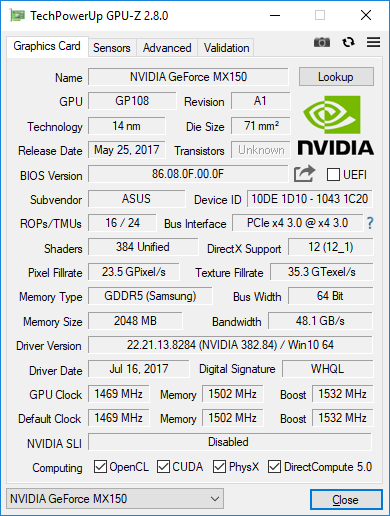 This week, Notebookcheck reported their findings of a second version of the GeForce MX150 – the newest version sporting lower base, boost, and memory clockspeeds versus the original SKU. Annoyingly however, these two versions are not being differentiated in advertising by NVIDIA or by OEMs. Diving into matters, it looks like this second MX150 is designed to be a lower performing, lower TDP version for smaller ultrabooks. Notebookcheck cited their GPU-Z results as showing two different PCI IDs, comparing the standard ‘1D10’ and variant ‘1D12’ to find a default clockspeed difference of 36% for base, 17% for memory, and 32% for boost. In turn, they cited 3DMark tests in estimating a 20 to 25% performance drop for the “1D12’ MX150, where a number of 13 inch ultrabooks had this variant but was not disclosed. Further investigation on our part does reveal that there is a documented understanding that they are different parts, at least from an OEM perspective. By way of the official Ubuntu Certified hardware database, PCI ID ‘1D10’ is documented as the ‘GP108’ MX150 variant of the ThinkPad T480, while ‘1D12’ is recorded as the ‘GP108M’ variant of the ThinkPad T480s. 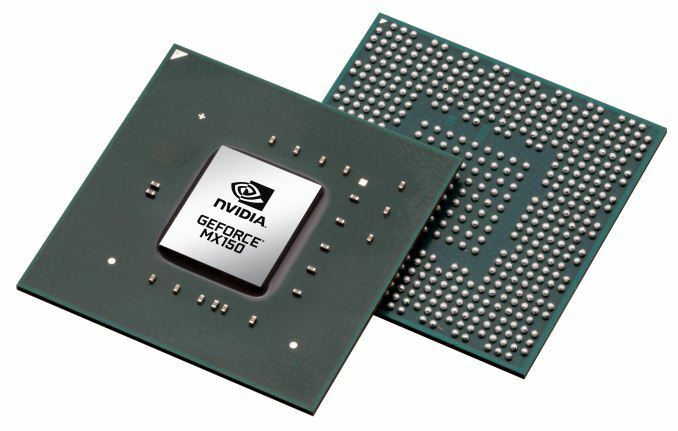 In this case, although ‘GP108’ and ‘GP108M’ may not be NVIDIA’s own terminology, the Ubuntu Certified process involves OEMs directly working with Canonical to test their hardware. 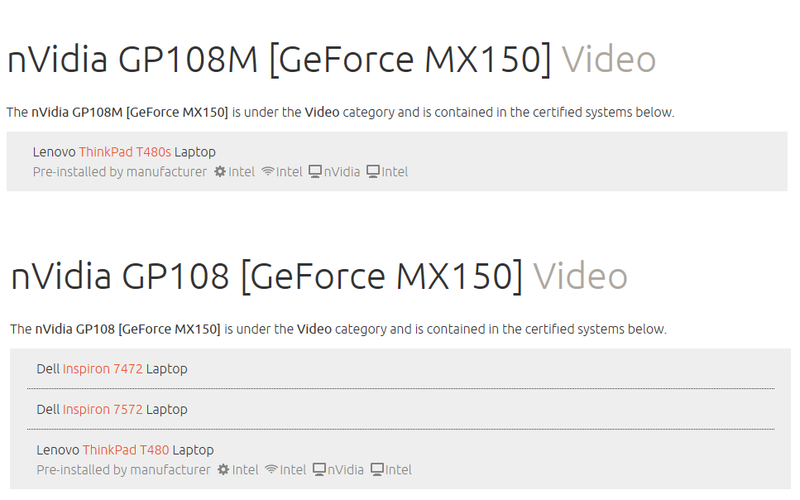 Canonical’s differentiation strongly implies that the OEMs are aware of MX150 variant. Continuing with the ThinkPad as the prime case study, each product page has no indication of any difference in discrete graphics adapters, though the T480s is the thinner laptop variant. 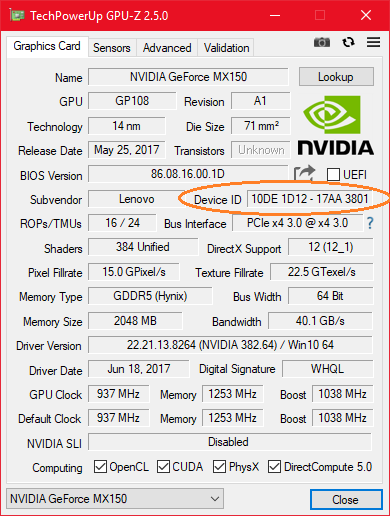 And while different cooling designs of laptops will change the exact clocks of the same GPU, the different PCI IDs and certifications suggest that this a vendor-side variant undisclosed to consumers. In total, Notebookcheck also noted the presence of the slower MX150 in the ZenBook UX331UN, ZenBook UX331UA, Mi Notebook Air 13.3, Envy 13, and IdeaPad 320s. And a cursory look at The PCI ID Repository again corroborates the idea of the two corresponding ‘1D10’ and ‘1D12’ PCI IDs, with a GP108 Quadro variant in the P500. From the January/February dates of the Ubuntu certification and PCI ID Repository entries, we can say this development has been ongoing for several months at the least. The engineering practicality isn’t in doubt here – constrained cooling designs of ultra-thin laptops necessitate lower discrete GPU clocks – but it appears that consumers were not notified of an explicit product difference. This is as juxtaposed with the OEM situation, where OEMs and/or NVIDIA did explicitly communicate to Canonical for the purposes of Ubuntu hardware certification. And while it is true that mobile and low-end (and especially mobile low-end) GPUs receive very little in terms of public documentation or vendor disclosure, this is why a lack of product transparency is a losing situation all around. Though we only came across the Ubuntu Certified database entries after reaching out, NVIDIA has declined to comment on the matter. However, with what we have collated, there seems to be little reason to doubt the undisclosed slower MX150 variant. I strongly disagree with "The lack of consumer transparency is a minor problem" , I could have been easily fixed MX150-E for energy efficiency , now you get NO CLUE what you buy? And those numbers make it look like the performance difference might be big enough for people to care. Do you currently publish a list of "chassis TDPs" we can peruse? Gosh golly gee that's a swell solution to the problem. Surely the average consumer will know to stop and search Morawka's Database of Chassis TDPs while standing at Best Buy, to know what they're getting. I too remember multiple instances of this.